Abstract : The China-Arab States BDS/GNSS Center, the first overseas center for China's indigenous BeiDou Navigation Satellite System (BDS), was officially inaugurated in Tunisia on Tuesday. TUNIS, April 12 (Xinhua) -- The China-Arab States BDS/GNSS Center, the first overseas center for China's indigenous BeiDou Navigation Satellite System (BDS), was officially inaugurated in Tunisia on Tuesday. 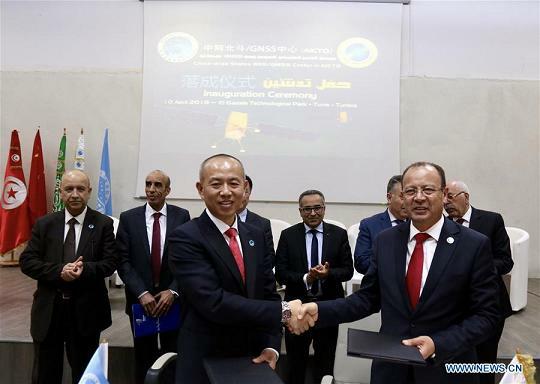 The center is established as a pilot project between China and the Tunisia-based Arab Information and Communication Technology Organization (AICTO), an Arab governmental organization under the Arab League, to promote the global application of the BDS, said Ran Chengqi, director of China Satellite Navigation Office. "The center could serve as both a window to showcase the BDS, and a platform for promoting international exchanges and cooperation," Ran said. Mohamed Ben Amor, secretary general of AICTO, hailed the center as a unique technology project for the Arab region and the entire world. AICTO will "intensify its cooperation with China in the field of satellite navigation to boost technological advance and economic development in the region," Amor said. For Khalil Amiri, Tunisia's secretary of state for scientific research, the BeiDou pilot project will help train satellite navigation scientists and develop digital economy in Arab countries. "We are working closely with China to effectively access and develop win-win database services via BeiDou and other satellites for various uses," Amiri said.